A single entry blog about my recent trip to Houston, TX where I played four rounds of golf and attended the Shell Houston Open. I just barely got this blog section up and rolling so I wasn't able to give a daily blog while in Houston, but I'll give y'all a summary blog entry instead. Houston holds a special place in my heart since I lived there for two years (all of 1997 and 1998) while serving a church mission. The people in the South are the nicest, most genuine people I've come across and I love going back to visit. In fact, that only thing that may be better than the people in Houston is the food they make. I just plan on putting 10-12 pounds before I leave and indulge myself for a week. Oh, did I mention the golf is good too? Well it is, and as large as Houston is it somehow seems to fly under the radar in the golf world. All of the courses were great but my favorite was Tom Fazio's work at Carlton Woods. It and Grand Pines at Bentwater offer something that virtually no Houston course does; elevation change. Houston is VERY flat; so flat that the only real hills in the area are those that are constructed by the pesky fire ants that swarm the area. Fazio took the property and gave it a look and feel that is more synonymous with Georgia than Houston (that's a good thing!). 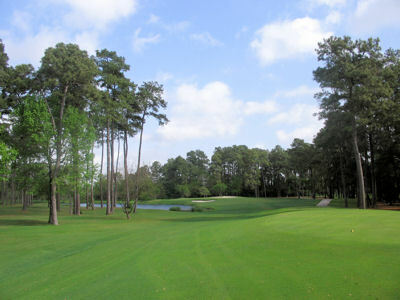 The lack of elevation change throughout most of Houston is what holds it back from being a bigger player in the golf world because it offers a lot in the form of large majestic trees, ample water, and golf weather year-round. The trip I just got back from with my brother (Rick) and wife (Stacy) wasn't near as golf focused, but a more balanced trip overall. We flew in Friday and spent the day at the Galleria Mall which represents the second largest mall in the country; only Minnesota's Mall of America is larger. The Galleria is huge and boasts an ice skating rink as the center piece. Every design store imaginable is located there as well as high end stores I wasn't aware existed. For example, we walked into a pen store where my jaw bone nearly shattered when it hit the floor after seeing the prices of the pens. Two steps in I found a pen priced at $1550! What?! I know these pens were higher quality than the 10-pack of Bics I usually buy, but c'mon - it's a pen for crying out loud! Saturday was spent sleeping in and heading down to Galveston island for a day at Moody Gardens with my good friend Diane Potter (aka Wonder Woman). 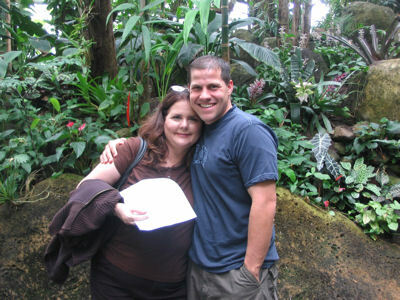 Anyone who has been to Galveston before will know why we spent the day at Moody Gardens rather than at the beach. If you haven't been, let's just say that the Mississippi River's deposits into the Gulf of Mexico have made Galveston's water and beaches more of a tourist detraction than an attraction. That night we ate we ate at Gaido's and had by far the best fish I've ever tasted after taking our waiter's recommendation and ordering the Red Snapper. Unreal how good it was. Who knew fish that good could come from the muddy waters of the Gulf? We then capped it off with a slice of pecan pie that also was to die for. The non-golf fun didn't stop there. Monday night my cousin Bret Bearup, former Kentucky Wildcat and current Advisor to the Denver Nuggets, who always is hooking me up got a hold of his friend Dennis Lindsey (VP of Basketball Operations of the Houston Rockets) who landed us three tickets to the Rockets hospitality suite. No only was everyone really nice to us while we stuffed our faces, but then one of the execs handed us a pair of front row tickets to enjoy the game a little closer. It was a blast; especially considering Houston threw a 19 point drubbing on the Bucks. We followed that up Tuesday night by attending the Texas A&M vs TCU baseball game and then sat center section of the orchestra level Wednesday at opening night of the touring Broadway hit Wicked. The show was phenomonal! I don't know what Simon from American Idol is smoking when he tells contestants that they aren't good enough for American Idol but would be great on Broadway because all the singing voices I heard during Wicked kicked tail over anyone on American Idol this season. I'm sure you're thinking, "Let's get to the golf for crying out loud." Fair enough. If I don't get to it soon I'll be five more paragraphs talking about the phenomonal steak fajitas we ate twice at Pappasito's, the classic andouille sausage and seafood gumbo and creme brulee from Pappadeux's, and the smoky delicious barbeque we pounded twice at Pappa's BBQ. Cap all that off with the gallon and half of Blue Bell ice cream we consumed for the week and I'm sure I met my goal of putting on 10-12 pounds. This year I played just four rounds and found myself at April Sound Country Club, Augusta Pines Golf Club, Lochinvar Golf Club, and Whispering Pines Golf Club. April Sound is pretty much an executive style course that the condo we were staying at sat on. I figured it would offer a nice little warmup for what the rest of the week had to offer. The course was actually in pretty good condition but the layout certianly wasn't anything special and was pretty typical for what one would expect to see from a course geared toward the retirement community it winds through. It was amazing to notice the signficance difference in how much better shape the courses were in at the end of March this year versus when I was in Houston at the end of February last year; what a difference a month makes. 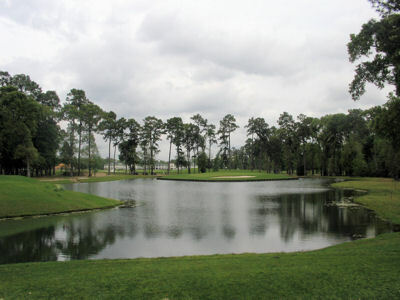 The first big course on tap was Augusta Pines, a course primarily designed by Dave Relford. 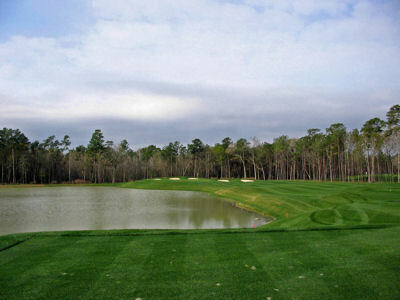 Developed by Tour 18 Inc. which created the Tour 18 replica courses in Dallas and Houston, Augusta Pines wanted to offer a little different concept than directly copying famous holes from well-known courses like the Tour 18 courses. It was easy to see the similarities of the Augusta Pines property with the property at Augusta National and thus an idea was born. Rather than building direct copies of Augusta National holes, Relford would take holes of his choosing and flip flop them so that many of strategies from Augusta National were present without making straight duplicates. I really enjoyed the course and was paired with a great guy and solid golfer; P.K. Harris. P.K. was out knocking some rust off getting ready to play in the mini-Texas tour he was a member of. The most unique feature about Augusta Pines is how the course finishes with two island greens; a par three followed by a par five. When all was said and done I carded a 79 on the day. Tuesday morning brought a visit to the highly exclusive, male only golf club Lochinvar. 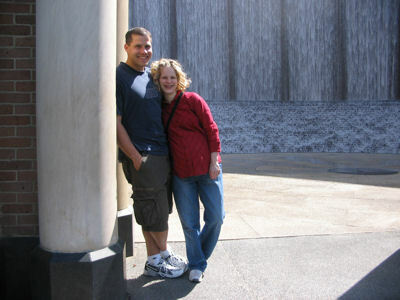 Like always Nikki (my GPS unit - see About Us section) was able to take me right there but I still missed the turn. There were no signs and no indication that a golf club was anywhere near and that is when I knew I was in for a treat. I flipped around and turned down the skinny road Nikki indicated fearing that it would lead to nowhere. Suddenly I arrived at a gate where I was able to phone into the pro shop and Head Professional Warren Chancellor Jr. let me in. Warren Chancellor Jr.'s father, a former PGA professional, is recognized as the founder of the "claw" putting grip that has become so popular in the game today. I'd read a few things on Lochinvar prior to coming, but I had no idea is was as nice as it ended up being. I took one step onto the property and an instant reverence and respect level overcame me. I felt like I was at Augusta National as I gazed at the towering trees, perfect conditions, and beautiful azalea flowers grooming the course. Lochinvar's layout was designed by Jack Nicklaus in 1980 and was a complete pleasure to play all day. Water comes into play on ten holes of the 7008 yard layout that features flattish greens and fantastic bunkering. At the end of the day a birdie on the 18th hole gave me a round of 78. The final round of the trip promised to be the best. Ranked as the best course in Texas by the Dallas Morning News the last two years, Whispering Pines was a treat I was looking forward to. The brainchild of owner Corby Robertson, Corby came up with the 18 hole layout and brought in Chet Williams of Nicklaus Design to work out the kinks. I loved the bunkering which was clearly inspired by Pine Valley (pretty good course to draw inspiration from), but the highlight of the course is the final six hole stretch with 14-16 being world class. 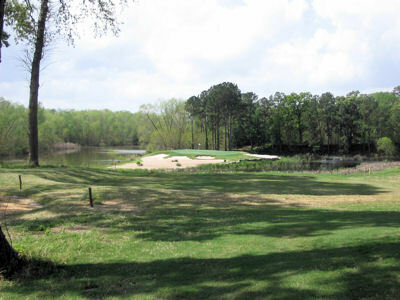 The 14th hole is a driveable par four that wraps around Caney Creek and sports the Bush Tree (named after George H. Bush like Augusta's Eisenhower Tree) on the inside dogleg. The 15th and 16th holes reminded me of the same numbered holes at Cypress Point; a short pretty par 3 (this one to an island green) followed by a big tough 228 yard par 3 that requires about 200 yards of carry over a water hazard. Rick and Stac joined me for the round and our caddy Corey took care of us for the day. Wanting to play well in front of my wife and brother caused me to rush my tempo and tanked my score to an 86. Oh well, it was one of the funnest 86s I've ever posted. Click here to see me pick an 8 iron out of the fairway bunker and leave myself a birdie putt. The final day of the trip was spent at the Shell Houston Open hosted at the Redstone Tournament course designed by Rees Jones. I played the course in 2006 and enjoyed it quite a bit, but was surprised by the layout considering it was designed specifically to host the PGA Tour when it rolled through town. The distance between holes 1 and 2 as well as 17 to 18 is absurd. In addition, it isn't very viewer friendly considering it is quite difficult to catch much of the action from any one spot. We found it much funner to just pick a group (Jason Gore and Padraig Harrington) and follow them around for a few holes. My conclusion after watching them play; I need to get better!